Word of the changes comes just weeks after Cupertino-based company became the target of a renewed advertising blitz from rival Microsoft Corp., which is using a new series of controversial television spots to cast Macs as overpriced novelty PCs that command a premium purely for their distinctive aesthetic. Still, people familiar with the matter say Apple's move towards more affordable Macs isn't so much a response to Redmond's marketing antics as it is an interim solution to combat the proliferation of budget notebooks —often called netbooks —until the company is ready to introduce its own take on the market in the much rumored Newton-like web tablet, a project which is taking considerably longer to complete than once anticipated. Those same people maintain that the Mac maker has absolutely no interest in catering to the netbook market as it exists today, which —as interim chief Tim Cook repeatedly points out —is comprised of systems with "cramped keyboards, terrible software, junky hardware, very small screens, and [a poor] consumer experience." While the tiny notebooks aren't threatening Apple's capacity to profit from its Mac business, the Windows-based systems are for the first time this year showing signs of hampering the company's potential for share gains and serving as a pesky reminder that the highly-competitive PC market isn't boundless, especially given the current economic climate and subsequent pullback in consumer spending. For the three-month period ended March, Apple announced that Mac units contracted by 3 percent, signaling the first time in nearly 6 years that the growth of its personal computer business reversed course on a year-over-year basis to see growth fall into red figures. Consequently, market research firm Gartner estimated that the company's share of the U.S. PC market slipped 10 basis points to 7.4 percent. Though the fall was marginal at best, it was the second time in as many quarters that Apple watched its share retreat while netbook maker Acer posted unit shipment growth upwards of 50 percent and beyond. As such, the company plans to institute changes that will rekindle growth and help it better contend against a barrage of cheap netbooks, all without devaluing the customer experience that had previously driven Mac growth for 23 straight quarters. More specifically, consumers in the coming months can look forward to more affordable versions of both the 13-inch MacBook and iMac, according to people who've proven extremely reliable in predicting Apple's future business directions. The MacBook —which currently starts at $999 when fitted with a previous-generation polycarbonate enclosure and $1299 in an aluminum unibody casing —is the bestselling Mac in terms of volume. The iMac is the most popular Mac desktop. 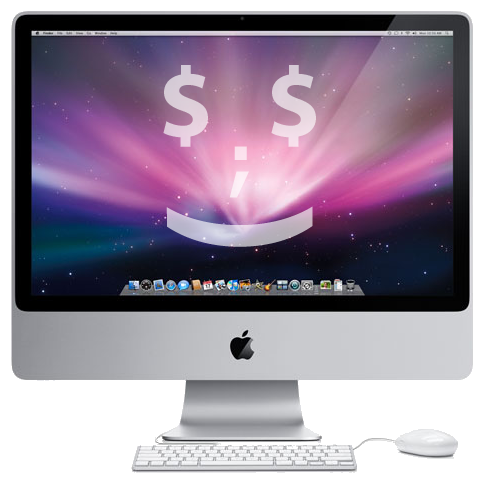 While exact pricing is unclear or still undetermined at this time, the Mac maker earlier this month quietly flaunted its capacity to deliver a premium system at near recession pricing when it began offering educational institutions a 2GHz, 20-inch aluminum iMac for $899. Even when priced at a $100 to $150 markup for the consumer markets —as Apple is more than likely eager to preserve its margins —such an offering would make a material dent in the entry-level cost of owning or switching to a Mac. It's believed that the first batch of more affordable Macs could turn up as early as this spring as part of a restructured MacBook line, while MacBook Pros for the most part would stay their course and benefit slightly from Intel's planned Montevina refresh, which should nudge clock speeds. This would afford Apple a means of sparking renewed interest in its portable products ahead of Intel's Nehalem-based "Calpella" mobile platform, which should land anytime between late this year and early next, and without having to tack on auxiliary features that would drive up costs at a time when the company is looking to lower prices. Meanwhile, Apple is also gearing up for its annual back-to-school promotion in early June that should, like last year, offer educational customers a free iPod touch with the purchase of any qualifying Mac. Should the promo, which typically runs through September, overlap the introduction of more affordable Mac offerings, their combination could land an isolated yet dizzying blow to rival's efforts to portray Macs as impracticable purchases during the current economic crunch.